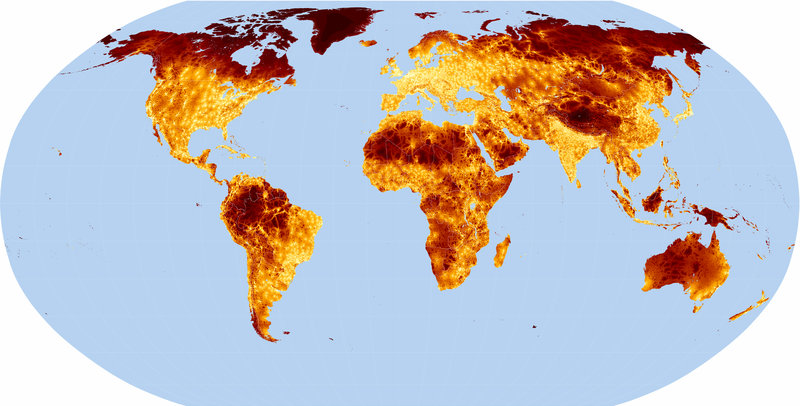 The data are in geographic projection with a resolution of 30 arc seconds. The format is integer ESRITM GRID format with pixel values representing minutes of travel time. The files are stored in a zip archive. The archive also contains an ESRITM Shapefile of the populated places. Other files include Metadata (XML), and ArcView 3 Projects and Legends (APR and AVL). This is an A0 sized poster of the global accessibility map in PDF format. It includes some general results from the Agglomeration Index analysis and a study of land cover patterns around cities. Nelson, A. 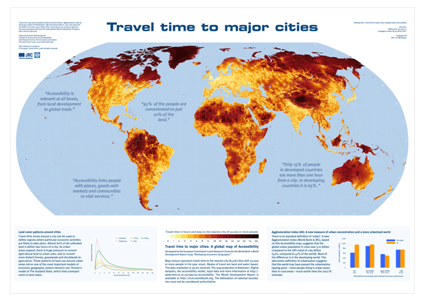 (2008) Travel time to major cities: A global map of Accessibility. Office for Official Publications of the European Communities, Luxembourg. DOI:10.2788/95835, ISBN:978-92-79-09771-3.